Albums, Coffee-Table albums, Prints, Canvases, Thank you cards and Signature Frames. Price indication for our Italian Style Bellissmo Albums square or rectangular shaped. A 8x6 inch 20 page book starts from £165.00 and a 12x12 inch 40 page book is £395.00. Sizes go upto 80 pages and 16x12 inches. Is your wedding in February or March 2009? In the table below you can find our price list for single square or rectangular shaped canvases. Our standard sizes range from 12 inches by 12 inches to a wall filling 40 inches by 60 inches. We can go bigger than this should you wish just get in contact for a quote. 2) Do they stretch their canvas over a traditional 4 piece frame with mitred joints and wedges in the back to help keep the canvas taught. - If not then they are likely making the frame out of one piece of glued wood or worse still sticking the canvas to a chunk of wood! Canvas is a natural fibre and will stretch and sag in different environments and humidity . Our frames can be retightened at any time by tapping the back wedges of the frame. Be aware that the only way to ever retighten a canvas over a glued one piece frame would be to take it completely off the frame and then re-stretch it! 3) Do they laminate their canvases? - We coat our prints with an archival laminate that both protects the canvas and lifts the colours of the print for the best quality finish available bar none. Other companies don't bother to fix/laminate their prints and as a result they scuff/scratch easily and will probably crack around the edges.. Some people spray their prints with a fixing coat. Again this just stops the print getting damaged and doesn't create rich colours or a professional finish. We are artists and only use the best materials for your prints to produce the best finish possible. Choice of different sizes and Covers with or without Dust Jacket. If you like a picture from one of the galleries then you can order 7"x5" professional prints from us at the special rate of £5 per print (plus £5 postage and packaging per order). You can order by post. Please put a note in with your cheque with the ID numbers of the pictures you are ordering and your name, address, and phone number. Our postal address "The Photos of my Wedding", 46 Leicester rd, Hinckley, LE10 1LT. You can also order by email and PayPal. Please send an email to prints@thephotosofmywedding.com with the ID numbers of the pictures you want and your name, address and phone number. What about other print sizes? Basically we can do almost any size you want, the list is almost endless, if you let us know what you are looking for then I can give you the price. Prints are available in lustre or gloss finish. Please add £5.00 for shipping to your order. For telephone orders 01455 611375. If you want to order any other sizes, or framed prints and canvasses, then please give us a ring for a quote on 01455 611375. This is an extremely popular item and comes in two different sizes, a5 and a6, and two different formats; landscape and portrait. You can choose single sided printed or double sided, so you can put a text inside or even another photo, a groupshot of the wedding party for instance to give your guests a lasting memory. 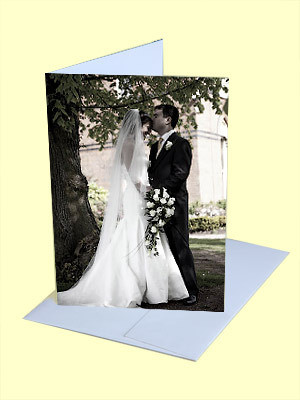 We supply the image(s) for the card and we print them and send them to you together with matching envelopes. The cards are printed on a brilliant white 300gsm white board and look fantastic. The whole process takes about a week from selection of your image. A6 is the folded size, approx 4" by 6" or 10.5cm by 15cm. A5 is the folded size, approx 6" by 8" or 15cm by 21cm. 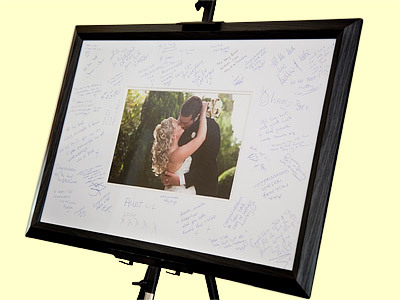 We put this frame up on your wedding day for your guests to sign on the outer edge. Then you select a picture from our wedding shoot to go in the frame to create a lovely keepsake. Choice of different frame colours. Also available in bespoke made to order sizes.